Clearly defined roles are one of the most important aspects when applying Creative Problem Solving in a group, just as clearly defined roles are essential for a rescue squad or a sports team. 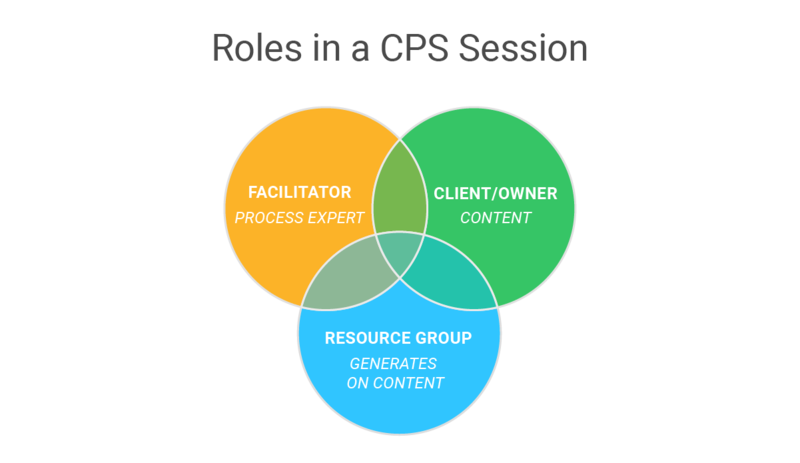 There are three essential roles for an effective CPS session: client, facilitator, and resource group. The person who owns the challenge and has primary decision-making authority on how it is to be dealt with is the client. Sometimes an entire team owns the challenge and all the members share the client role. The facilitator is the process expert who manages the Creative Problem Solving process and keeps the group and the client moving toward a successful resolution to the challenge. The facilitator is never involved in the actual content of the session. For example, changes, modifications, or the facilitator’s attempt to improve ideas that the group generates are forms of judgment and will stifle and derail the creative process. The people who generate options or ideas to help deal effectively with the challenge are the members of the resource group. These individuals are trained in Creative Problem Solving methods. I recommend that some of the resource group members be well versed in the problem on which the group is working, but it is also helpful to have some people in the group who are not familiar with the problem at all. It is these people who bring a fresh perspective to the situation. These are the people who don’t know what can’t be done. They are not aware of the previous methods that have been applied to the problem, that may or may not have worked, and therefore don’t have those mental blocks. An effective Creative Problem Solving resource group is five to seven people. If there are less than five people in a group, the members will be working pretty hard to generate problem statements and ideas. If you have more than seven people in a group, a behavior called “social loafing” often occurs. Social loafing happens when the group is big enough for members of the group to “hide” in it. In groups larger than seven people, it is much easier for one or two members to hang back and not participate. So, if you have more people involved in the problem, you might consider forming two sub-groups with a facilitator in each group. It is also helpful to have a facilitator assistant who has equal or more experience than the facilitator. This “process buddy” can remind the facilitator of the appropriate Creative Problem Solving techniques to use, help to post flip chart paper and give the facilitator another pair of eyes and ears to monitor the group process. You can read more about the roles in a Creative Problem Solving session in my book, Leading on the Creative Edge. When was the last time you deliberately defined roles in a meeting? When you did, how did it work?